Shorkie Puppies Make Great Therapy Dogs! We specifically breed for health and temperament. 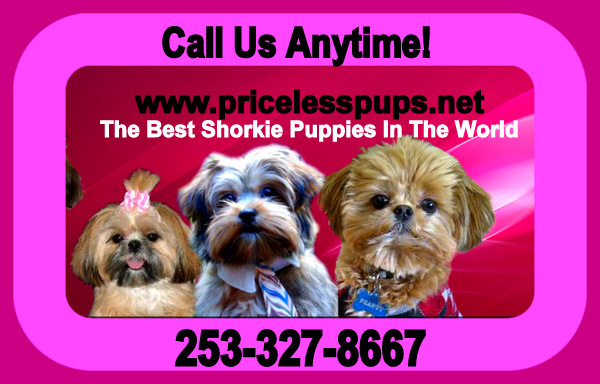 The temperamnet of our Shorkie puppies make them great for families that have special needs. Whether the needs be physical or emotional. Several of our puppies have gone on to serve and both Therapy dogs or ESA pets. ( Emotional Support Animals). Many of the families have noticed these beneits for their children from having one of our Shorkie puppies. Most importantly, our Shorkie puppies are full of compassion and patience which will promote a positive impact on these children for life and even adults. Please meet some of our Puppies who are now Official Theraly Dogs! Hi Steffy!! I have been meaning to write to you for a very long time now...I just wanted you to know that I am so unbelievably happy with my furbaby Winnie (Milani). She is now 2 1/2 yrs old and I cannot imagine my life without her in it! I told you what I was looking for in a dog and you chose Milani for me and what a perfect choice it was! She is the most beautiful dog I have ever seen! lol I mean it! Her face is perfect and everyone who sees/meets her thinks the same. I tell everyone about you and your pups! Her fur is a beautiful shade of beige/blonde and her fur is as soft as silk. She is the biggest snuggle bug and a true companion to me. She never leaves my side... unless my mother or grandmother are in the room haha! I am a Licensed Professional Counselor and I had Winnie (Milani) certified as a Pet Therapy dog. I am now able to bring her to work with me everyday and she is an emotional support for many people she comes in contact with. She makes people laugh with her bursts of energy and ability to play and race around the room. She also comforts those who are sad by keeping them company and licking their tears! She is an angel :-) I cannot express how happy I am with Winnie. Thank you for your dedication and care. Here are some photos, although I have millions of her lol. Many of our Shorkie Puppies have passed their Good Citizen Canine by the time they are just 1yr old which is testimony in itself how eager these little puppies are to please. Welcomes being groomed, brushed; allows paws and ears to be handled. Walks as directed on a loose leash. Moves politely through a crowd. Sits, lies down and stays in place on command. Behaves politely around other dogs. Reacts with confidence to distractions. Can be left with a trusted person. The term Emotional Support Dog refers to a dog that provides therapeutic benefit to an elderly individual or individual with a disability. The primary purpose of an Emotional Support Dog is to provide the owner with affection,companionship, and provide motivation. Emotional Support Dogs should be trust worthy and have friendly dispositions. An emotional support animal prescribed by a licensed mental health professional), the Fair Housing Amendments Act of 1988 requires the landlord/property manager to make a reasonable accommodation to their policies and allow the tenant to have an emotional support animal. This includes species, breed, and weight policies. That means if they have a "cats only" policy, they must accept your service dog. If they have a policy that allows dogs weighing no more than 30 lbs. and your emotional support animal (ESA) weighs 75 lbs., they must make a change in the rules to accommodate you. The one requirement for a person to legally qualify for an emotional support animal (ESA) is that the person has a letter from a licensed mental health professional (therapist, psychologist, psychiatrist -NOT the family doctor) on his/her letterhead that states the person is under his/her care, is emotionally or psychiatrically disabled, and prescribes for the person an emotional support animal. Without this letter, if the person presents an animal as an ESA, he/she is in violation of federal law; an offense punishable by fine and imprisonment, if convicted. Ask a tenant to pay a deposit, fee, or surcharge in exchange for having a service or emotional support animal, even if they require such a practice from owners who wish to obtain pets in their dwelling. Require the emotional support animal to wear or carry any special collar, harness, vest, emblem, or other means of identifying it as such. Inquire about the extent of the disability, or ask for detailed medical records for the individual requesting the service or emotional support animal. Refuse to accommodate you and your animal because their insurance policy won't allow a species, breed, or weight. They are still subject to the law. You may take your ESA dog on the plane with you FREE OF CHARGE.. but you will need all the required documentation and make PRIOR arrangements.